Heat oven to 450°. Mix flours, cornmeal, baking powder and salt in large bowl. Cut in shortening, using pastry blender or crisscrossing 2 knives, until mixture looks like fine crumbs. Stir in oats. Stir in just enough milk so dough leaves side of bowl and forms a ball. Place dough on lightly floured surface. Knead lightly 10 times. Roll or pat 1/2 inch thick. Cut with floured 2 1/2-inch round cutter. Place on ungreased cookie sheet about 1 inch apart for crusty sides, touching for soft sides. Brush with milk and sprinkle with oats if desired. 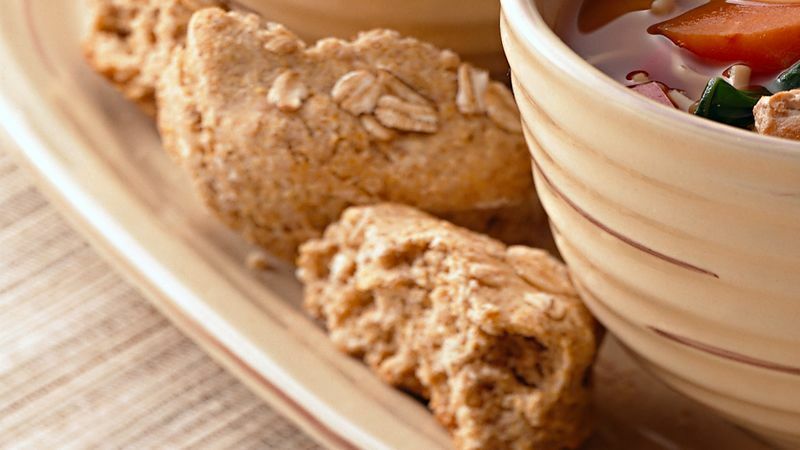 These tasty biscuits contain three different grains: cornmeal, whole wheat and oatmeal. Combining grains adds flavor, texture and fiber, plus variety, to your eating plan.